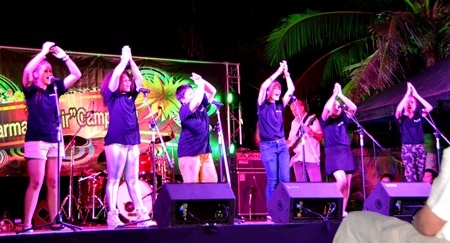 The Karma Music Sound Studio introduced 22 Sattahip students to music and dance training at a beachfront house in Bang Saray. Karma owner Supisa Williamson said the third-annual training camp held March 28-30 is open to about 20 participants of all ages each year. The only requirement is that they long to sing, dance and play music. The workshop provides both individual and team training over three days and two nights. The course aims to develop skills, discipline, responsibility and teamwork in the students. Students perform international choral music on stage. 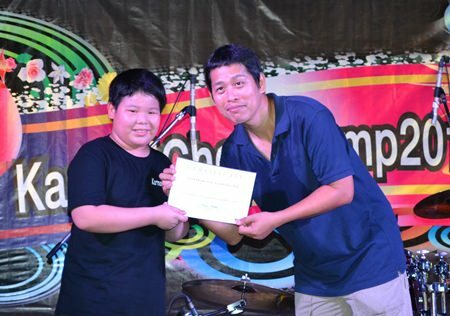 The music taught in the camp is international, covering various genres depending on the abilities of the students. This year, participants generally learned quickly and showed satisfactory results. Certificates were presented to every participant. Karma Sound Studio is equipped with modern equipment and has been used to record music by many famous Thai artists. The place is very quiet and peaceful, suitable for training requiring concentration. Its facilities include a swimming pool, gym, tropical garden and a big yard for holding concerts. It awards official certificates to graduates. Karma is located on Bang Saray Beach, opposite Nong Nooch Tropical Garden. For more information, call 089-833-7363. 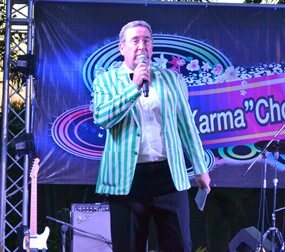 David Williamson, the owner of Karma Studios, presided over the final day concert of the Karma Kids Camp 2014 on Sunday, March 30. 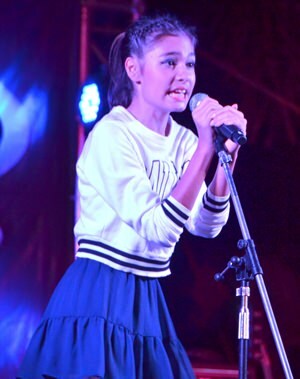 A budding, young singer demonstrates her vocal talents to the audience.